I thought she was crazy when my friend Becky started collecting 1950s furniture in the 1980s. I grew up with those armless sectionals and amoeba-shaped coffee tables. Maybe that’s why as an adult, I saw zero appeal. Now I envy how Becky has decorated her San Francisco home. Funny how the passage of time gives you a better perspective on design. That furniture is easy on the eyes. It’s well-constructed. It’s colorful. It’s unique. And it’s on-trend now. 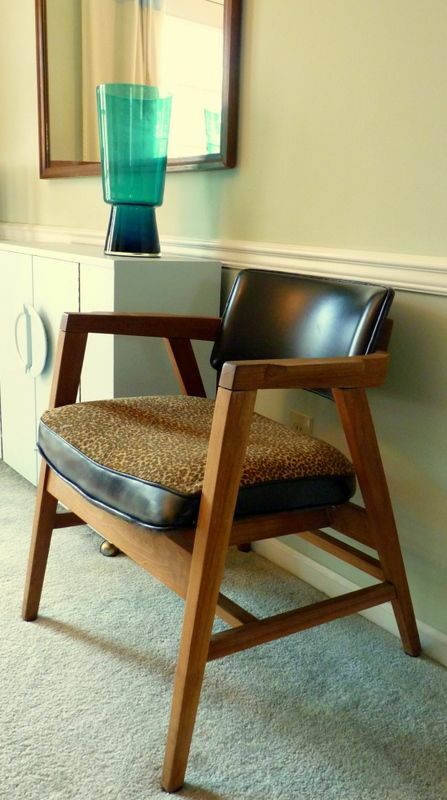 Mid Century Modern furniture designers were recognized as rule breakers at the time. The novel concept to design furnishings where form followed function began in the 1930s. In the 1940s when furniture makers discovered what could be done with new materials like plywood, fiberglass, wood veneers, molded plastics, and synthetic pigments, they set off on a new and exciting path. And the rest is history. 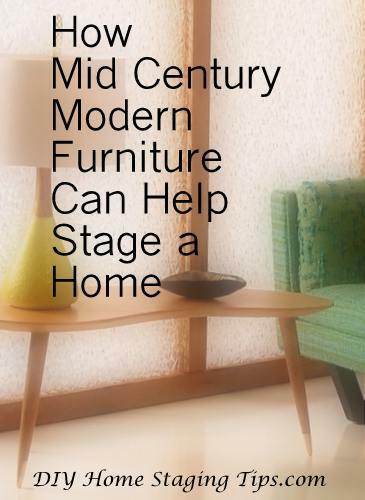 If you are staging your home to sell it, here’s what you should know about MCM furniture. You don’t have to have a glass-walled ranch house to use MCM furniture. These streamlined pieces mix with most décor and furniture styles, from shabby chic to ornate Asian. I've owned the chair you see above for twenty years. I rescued it from a house being torn down. It's solid teak and weighs about 30 pounds! I took the seat apart and replaced the old tweed fabric with an animal print, stitching it to the original vinyl part of the seat. No matter where I live or how I decorate, it looks at home. MCM furniture is accessible. Sure, the pristine originals and the high-quality reproductions are pricey. But you can often find vintage pieces on Craigslist, in thrift stores, and at other second hand sources. If the piece is in excellent condition and the seller is knowledgeable, the price may reflect the value that collectors place on 50s furniture. But often these pieces come onto the market because someone is cleaning out grandma’s house, or the piece needs repair, and that’s when you can score a bargain. perfect candidate for home staging. BHG photo. 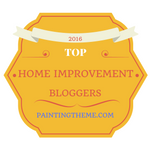 The colors typical of MCM design are usually fine choices for home staging. Wall colors tended to be dusty tones of pinks, greens, tans, and blues. But the palette also includes today-colors like cyan, lemon, tangerine, and lilac. Home staging welcomes the natural woods and plastic woods, the pastel colors and black accents that are integral to these furnishings. Another element that makes MCM furniture great for home staging is that it can make rooms look more spacious. Chairs have open arms. Some chairs are made of wire. Bookcases have pencil legs. Tabletops are glass sheets on aerodynamic bases. 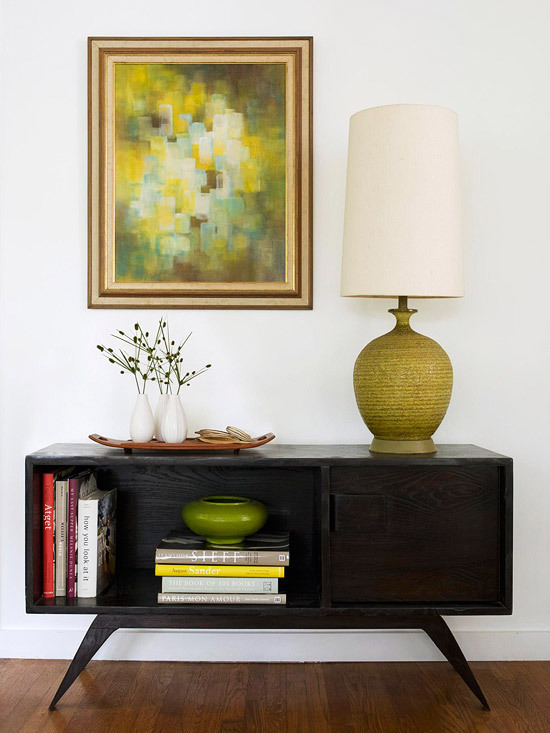 Credenzas hide clutter. arrangement. These pieces will create a clean, comfortable and edgy look in most homes. MCM can manage to look comfortable and warm, and at the same time industrial. The original designers turned to mass production because they wanted to produce “democratic furniture.” As a result, many pieces do have an industrial vibe to them. But because of the use of light-toned woods and playful geometric textiles, these pieces stop short of looking cold. That’s a perfect prescription for home staging success, a style that appeals to the masses. 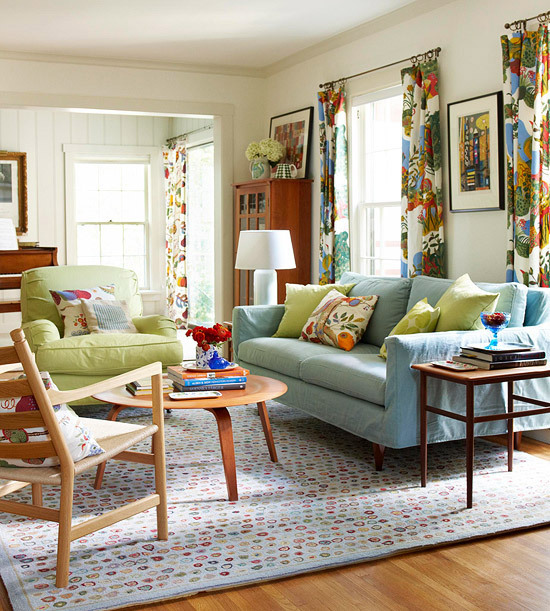 and floral drapes, they stay true to themselves yet look fresh. BHG photo. If your MCM furniture is in good condition, it will evoke memories for some of a more innocent era, when home ownership was easy by comparison to today, and when people were happy with a slower, simpler life. For young people who appreciate vintage, the charm is still there, without the grandma ruffles and florals. 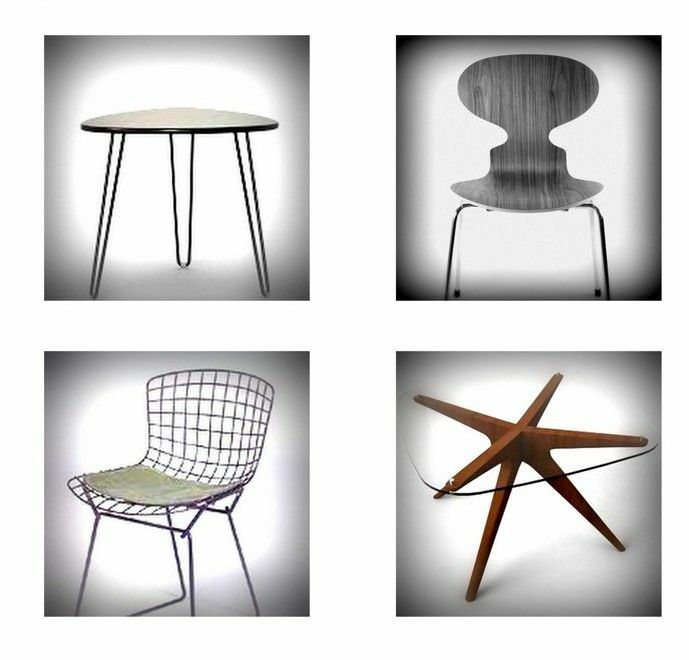 Mid Century Modern pieces have made their way to collections in New York’s Museum of Modern Art. They will never lose their value. Incorporate some MCM to increase the value of your home on the market by making it look more attractive, tasteful, and comfortable. 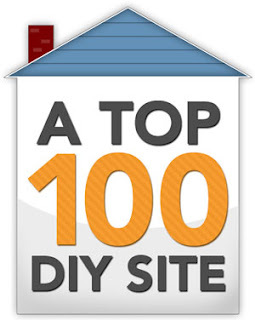 You can learn more tips on furniture styles, demographics, decluttering, furniture arrangement, curb appeal, and all things home staging related, if you download my eBook, DIY Home Staging Tips to Sell Your Home Fast and for Top Dollar.